Objective: The Developmental Profile Inventory (DPI) was constructed to assess psychodynamic personality functioning by self-report. 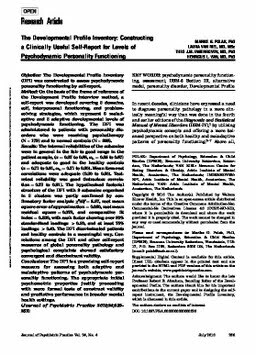 Method: On the basis of the frame of reference of the Development Profile interview method, a self-report was developed covering 3 domains, self, interpersonal functioning, and problem-solving strategies, which represent 6 maladaptive and 3 adaptive developmental levels of psychodynamic functioning. The DPI was administered to patients with personality disorders who were receiving psychotherapy (N=179) and to normal controls (N=228). Results: The internal reliabilities of the subscales were in general in the fair to good range in the patient sample, (α=0.67 to 0.88, ωh=0.52 to 0.87) and adequate to good in the healthy controls (α=0.71 to 0.91, ωh=0.71 to 0.90). Mean item-rest correlations were adequate (0.30 to 0.50). Test-retest reliability was good (intraclass correlation=0.73 to 0.91). The hypothesized factorial structure of the DPI with 9 subscales organized in 3 clusters was partly confirmed by confirmatory factor analysis χ2/df=2.37, root mean square error of approximation=0.060, root mean residual square=0.078, and comparative fit index=0.630, with each factor showing over 80% standardized loadings >0.30, and at least 75% loadings >0.40. The DPI discriminated patients and healthy controls in a meaningful way. Correlations among the DPI and other self-report measures of global personality pathology and psychological complaints showed satisfactory convergent and discriminant validity. Conclusions: The DPI is a promising self-report measure for assessing both adaptive and maladaptive patterns of psychodynamic personality functioning. The appropriate initial psychometric properties justify proceeding with more formal tests of construct validity and predictive performance in broader mental health settings.